Men often become overwhelmed trying to determine the difference between engagement, wedding, and anniversary rings for women. It can be a bit confusing when to trying to figure it out, especially when just starting out ─ and of course none are mandatory. Every woman has the option to wear one, two, three or even none of them. Engagement rings: These are traditionally given to the woman by the man when he asks her to become his wife or when they announce their engagement publicly. 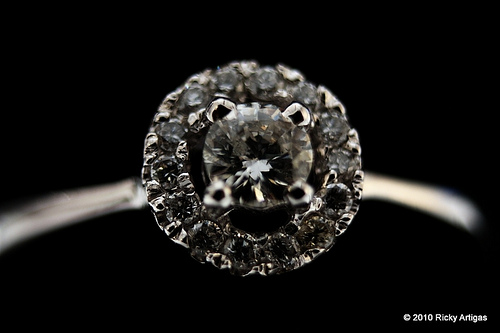 Most engagement rings contain a diamond ring, as this is the hardest and most valuable gem. When choosing a ring, it’s important to remember that a diamond is forever. The solitaire style ─ consisting of one large diamond in the center of the band and sometimes flanked by smaller ones ─ is a very popular choice for engagement rings. Wedding Rings: A wedding ring, otherwise known as a wedding band, is given to the women by her husband-to-be during their wedding ceremony. Traditionally these rings were gold bands, but today they are often white gold, diamond encrusted, or both. The man often receives a wedding band during the wedding ceremony as well, representing his everlasting love to his wife and letting everyone know he’s taken. Anniversary Rings: While the least common of the three, anniversary rings for women are a wonderful way for men to show their wives they’d marry her again in a heartbeat. These can be given to mark a special anniversary, the birth of a child, or any occasion close to the couple’s heart. Diamond anniversary rings for women are a great way to show her how much she really means to you. Juno Jewelry has rings to match her engagement and wedding rings, with unique styles that stand out from the crowd. Whether you’re looking for a simple and sweet ring, such as our Channel set Diamond Cords Edge Eternity Ring (1 ct.), a distinctive style, such as our Diamond and Ruby Eternity Ring, or really want to impress her with our Channel Set Princess Diamond Eternity Ring (4 ct.) ─ we’ve got something to fit her style. At Juno Jewelry, we’ve been providing women with the highest quality eternity bands for more than 30 years. All of our rings are manufactured in the United States for the finest quality, featuring gorgeous detail work by our very own in-house craftsmen. We strive to offer our customers top-quality products at the most competitive prices around.